In the introduction to her recent book, Gigi Rosenberg shares an anecdote about her first grant proposal: an application to the Boston Film/Video Foundation (now, sadly, defunct) for a documentary project. She says that instead of clearly and confidently expressing her goals and intent, she was really hoping that a grant would confirm something more personal: that she really was an artist. We asked her about the book, about her journey from grants novice to expert speaker and grants writing workshop leader, and about some common struggles artists face in searching for funding for their work. ArtSake: You bring up that artists sometimes seek “permission” for their projects rather than confidently present them as worthy of support. Not to stoke the whole art vs. science notion, but why might an artist be more tentative about proposing a project than, say a scientific researcher? Rosenberg: I have made this mistake and I know other artists who have too – we apply to the funding organization for money but we’re really asking them for so much more than money – we’re asking them to love our work, to support us in non-monetary ways and to cheer us on. This kind of support really isn’t the job of the funders! I encourage artists to find artist groups, colleagues and friends to support their creative endeavors. Scientific researchers have all kinds of support – their collaborators, research partners, laboratory workers, and so on. They also have a society that has a high regard for scientific research – a higher regard (in some circles) than for artistic endeavors. But don’t let that dampen your spirits – artists need to foster networks, communities, friendships, colleagues, and groups that support them to do their best work. ArtSake: I really like that you acknowledge the emotional and psychological aspects of looking for artist funding. What’s the first thing you’d say to a disappointed applicant who didn’t receive funding? Rosenberg: The first thing I’d say to a disappointed applicant is don’t take the rejection personally. This isn’t about you as a person. The second thing I’d say is: Can you use this rejection to learn anything about your proposed project? If you can, find out why the funder rejected your application. Ask them: What could I have done to make this a stronger proposal? You may discover that they only had money to fund 5 projects and you were number 6! Or you may find out that they aren’t interested in a particular aspect of your project or that you made a big goof on the budget. Any information you receive in this follow-up can be a gold mine of information for your next proposal. To be an artist you have to have the skin of a rhino and the heart of a poet – this is one of the hardest aspects of being an artist – but you could say the same thing about being a human being! Rejection is a huge part of the business of being an artist. People are going to say “No” a lot. Sales people don’t take it personally when a potential customer says no – and if there’s any way you can, in the best way, adopt that attitude it will help you continue to make work and get it out there, any way you can. Lastly, don’t isolate yourself. All of us need cheerleaders – just don’t rely on arts organizations to be your cheerleaders – find friends and colleagues who can do it. ArtSake: What are some of the common missteps you see in artist statements that prevent them from effectively representing the artist’s voice? Rosenberg: It’s very challenging to write about your work in an artist statement because you have to write about your work as if you didn’t make it. Few of us think about our themes when we’re making something – we’re just making it. I think it helps to interview other people to ask them what they see in the work – that can help an artist find the language. Or have someone interview you and get you talking about your big idea. Artists tend to write clichés in artist statements or use lingo and jargon when they get scared and just want to sound smart. Write past the clichés, talk through your ideas, until you’re expressing them with fresh language that really means something. Rosenberg: My experience sitting on a panel judging artist applications blew my mind. I realized how many artists have great ideas but don’t know how to write about the idea in a way that engages others or even to follow directions. Also, many applicants don’t understand how daunting it is to be staring at a mile-high pile of applications. As a panelist you want to find any way to make the pile smaller. And if an applicant didn’t follow directions, that’s a great reason to toss them from the pile. Competition for grants is stiff and the margin for error is narrow. I learned how important it is not to give the panel an easy reason to disqualify your application. I also learned how to see the process from the other side of the table. So, now when I apply for a grant, I ask myself: How can I make this project irresistible to this funder? This helps me prepare an application that has a much better chance of succeeding. Don’t forget, however, that you don’t want to tweak your project so much that it doesn’t feel like your project anymore. 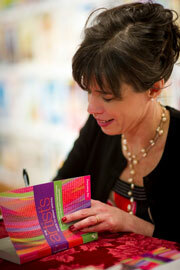 ArtSake: Along those same lines: your book has smart, practical tips for grant applicants. Do you have any advice for grants panelists and arts funders? Or just a message they could benefit from hearing? Rosenberg: Being a panelist and an arts funder is a hard job – they are underpaid and overworked – but they already know that! I’d want to tell them how much I appreciate what they’re doing – trying to find the right artists for the funding they have. They are so underappreciated – so I’d want to say thanks – it’s a hard job you have and you do it with so much integrity! ArtSake: Your book’s epilogue has the title “Make Art,” a reminder never to let that part of the process drift out of sight. How does your thinking about, writing about, an artist’s career affect your creative work? Rosenberg: I think what you’re asking is how writing a “how to” book affected my own creative life as a writer – is that right? If so, writing the book turned out to be incredibly creative. It was like editing a documentary film – where you have all these interviews and your own experience and then just plain advice and tips to share and then figuring out how to splice that all together in a way that is coherent – that process was intensively creative. I loved interviewing successful artists and having the right to ask questions about their own creative process and how they are successful with getting their work recognized and funded. I loved having the right to be nosy and the interviews were very inspiring to me. Of course it’s always easier (I think) to cheer somebody else on – but the book gave me lots of practice in being an encouraging presence – on my good days, I follow my own advice – which is to work as deeply as I know how on my own writing and then when it’s good enough to send it out! Gigi Rosenberg has upcoming events in Seattle (keynote at BizArt Conference, Friday, March 25); New York City (author events at Foundation Center, Monday, March 28, 2 PM and at Barnes & Noble, sponsored by New York Foundation for the Arts, Thursday, March 31, 7 PM); Washington D.C. (Foundation Center, Friday, April 1, 1:30 PM); and Baltimore (keynote at Maryland Writers Conference, Saturday, April 2, 9 AM). See a full events schedule. Gigi Rosenberg is a writer, speaker, and workshop leader. Her book The Artist’s Guide to Grant Writing (follow on Facebook) grew out of the professional development workshops she launched in Portland, Oregon, and teaches in New York, Chicago, and throughout the Pacific Northwest at colleges, conferences, and arts organizations. Her writing has been published by Seal Press, The Oregonian, Parenting, and Writer’s Digest; performed at Seattle’s On the Boards; and broadcast on Oregon Public Radio. 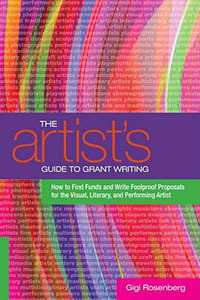 Images: Gigi Rosenberg (photo by Christian Columbres); cover art for THE ARTIST’S GUIDE TO GRANT WRITING by Gigi Rosenberg (Watson-Guptill, 2010).